Historically in West Cumbria there has been little or no provision for homeless adults who do not fall into the ‘priority’ category in the local authority. This often means a life of sofa surfing, living in unsafe conditions, being subject to exploitation and living rough on the streets. Without a fixed address they cannot get work or access to training so are unable to start rebuilding their lives. Time to Change (West Cumbria) was set up in 2013 to tackle the issue of homelessness and subsequent unemployment in the area. Calderwood House, an eleven bedroom hostel in Egremont was opened in 2015, prioritising homeless ex-service men and women. Many residents struggle with issues associated with homelessness such as the feeling of isolation and loneliness and problems with mental health, as well as tackling drug and alcohol addiction. 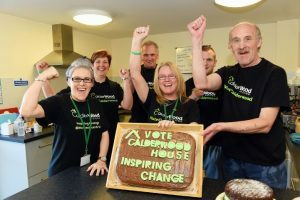 At Calderwood House they learn to live together in a community, sharing the cooking and cleaning, as well as developing skills and knowledge through work experience and training, including working on local community projects. One of the conditions of their stay is they stay free from drugs and alcohol, and testing is carried out. It received £41,334 in 2017 from the Fresh Ideas Fund to help the charity improve its financial sustainability. 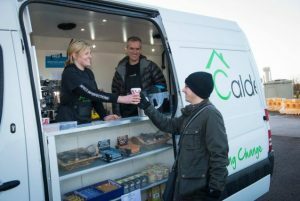 It purchased a mobile coffee van from which residents sell its own brand specially blended coffee. The coffee is packaged in-house and sold to the consumer market. For the residents, the purchase of the van not only meant new training but also paid employment. In 2018 Time to Change received a further £7,000 from the Lord Egremont Fund and the Shepley Group Fund to start a new allotment project. Residents work together, under the supervision of a trained horticulturist to grow vegetables that are then used in the kitchen. The project offers a safe and healthy space to work as a team, giving residents a support network to deal with issues such as isolation, depression and low self-esteem, as well as getting them out in the fresh air. Since 2015, the charity has been awarded almost £70,000 in grants towards the running of the hostel and its projects.